For the last couple of years, my two sisters and I have foregone buying Christmas presents for each other, and instead book a running vacation together. We call it our “Sister Run-Cation”! Rather than spend money on clothes, jewelry, or other material things, we spend it on what’s more important to us: Time together, traveling, new experiences, and of course, running! We choose a destination half-marathon to travel to, usually somewhere warmer during the February-March time frame. It’s a nice reprieve from the snowy, cold tundra that we all live in. Plus, we all live far enough apart that we don’t get to see each other often, so it’s a good excuse to get some quality sister time. Two years ago, we flew to Austin, Texas to run the Livestrong Austin Half Marathon. 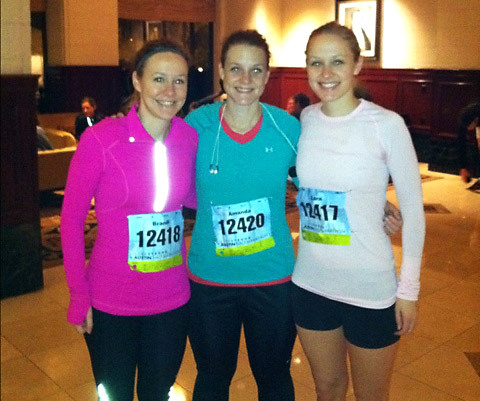 Three sisters take on the Livestrong Austin Half Marathon! That was probably my favorite half marathon I’ve ever run. I liked the course and loved that there were tons of cheering people. Plus, the city was amazing to spend a few days exploring! I definitely recommend it. 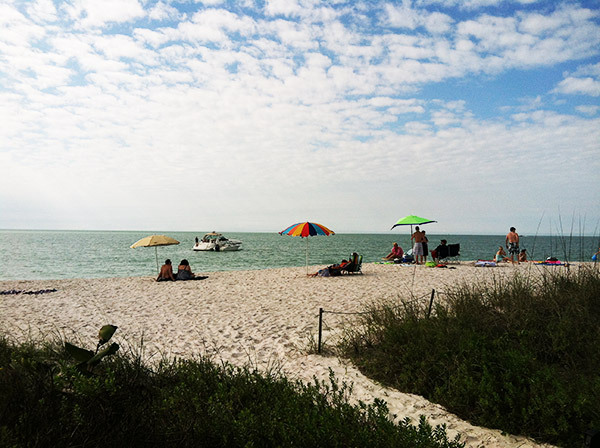 Last year, we chose an even warmer destination: Naples, Florida. Beach time in Naples, Florida. The Naples Daily News Half Marathon was well organized, and the city was cute and relaxing to vaca in. I’d love to go back for a mini getaway weekend. 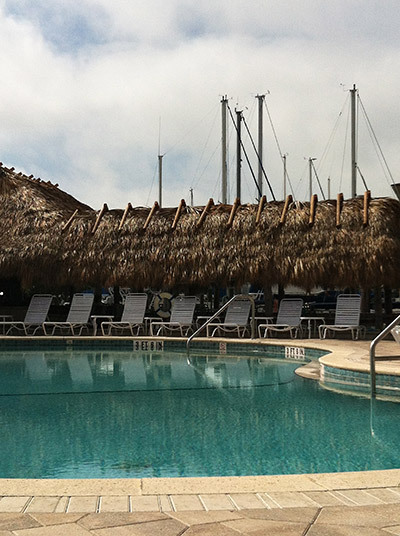 Post-race poolside in Naples, Florida. But, the race itself turned out to be my least favorite half marathon ever. Despite how happy I look, the mild heat was killin’ this Wisconsinite! Having trained through the cold Wisconsin winter for months leading up to this, the heat & humidity killed me! If you’re good at adapting to temperatures, or live in a warmer climate, then I would definitely suggest Naples to you…otherwise, it might be a bit brutal. This brings us to Sister Run-Cation 2014. I’ve always wanted to do a Rock’n’Roll series race, they seem like fun with all the live music. Plus, I know New Orleans would be an awesome place to stay and have fun at for a couple days once the race is over. I’ve never been to San Fran, but would love to see it! Plus, it’s close to wine country, and us sisters would love to celebrate with some winery tours […once the race is over]. 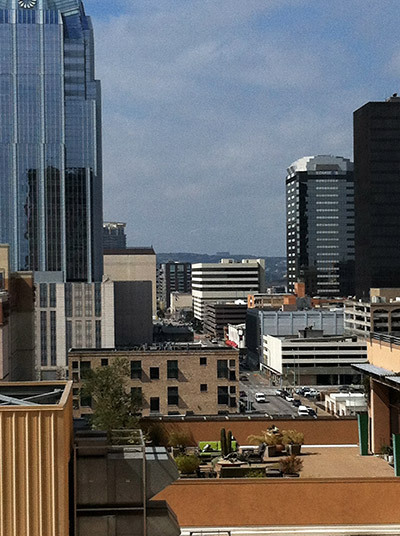 Only downside is, we hear San Fran can be pricey. However, this is the least expensive race fee at just $55. I’m guessing this would be a low-key place to stay—it looks like it’d be too cold to be hanging on the beach, and I’m not sure what else there is to do in Myrtle Beach? But, it’d def give us some R&R time! 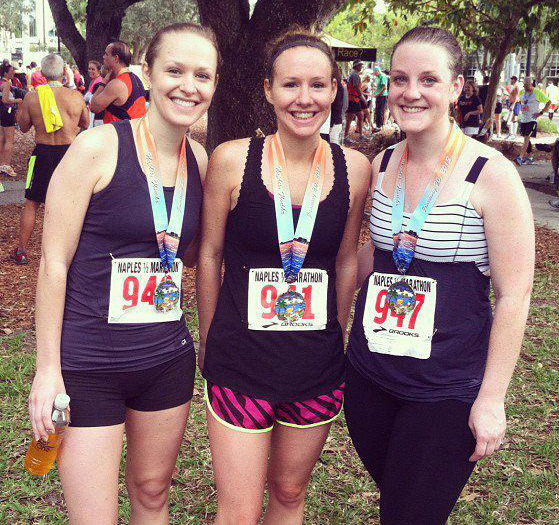 Do you know of any good half marathons in February or March? What is your dream destination race? 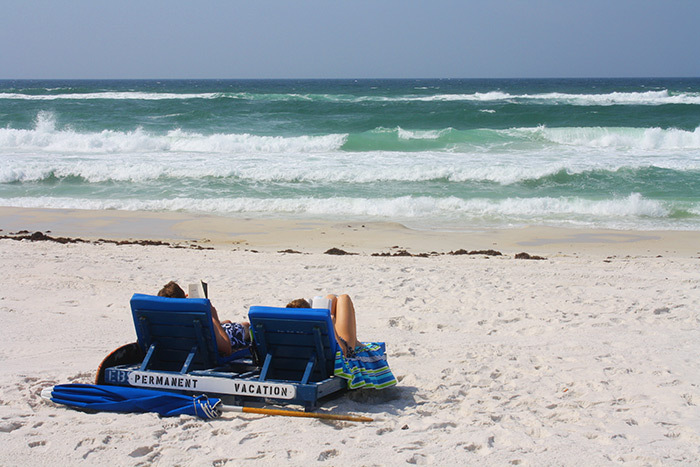 Would you ever go on a “Run-Cation”? 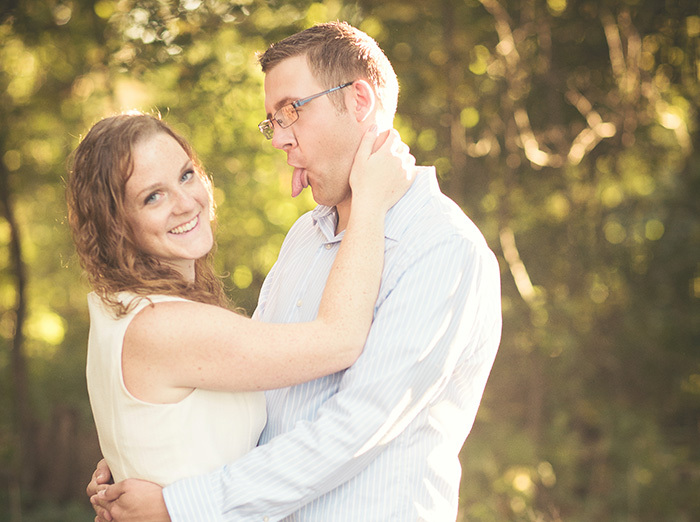 But THESE pictures…taken by a professional, and such a talented & creative photographer at that. 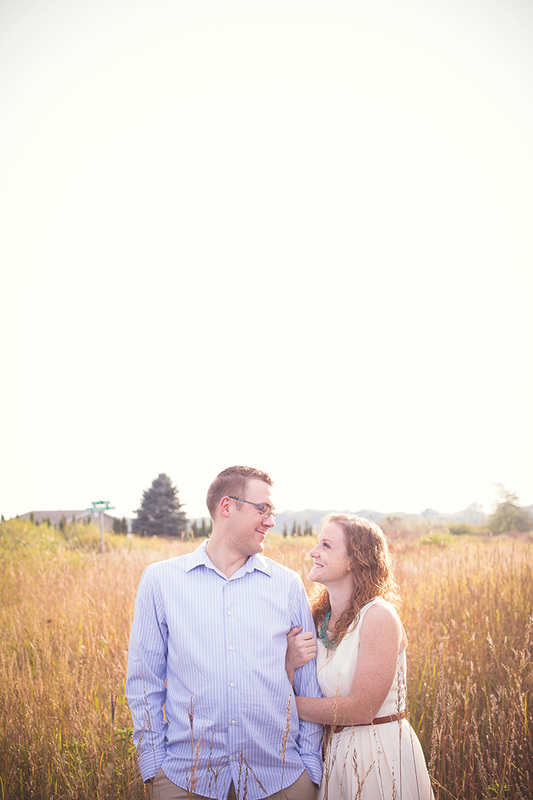 Capturing the moments between Matt and I, the looks of love that I usually only get to see one side of. It’s really lovely to not only feel that love, but to be able to see it. I just can’t get over them! 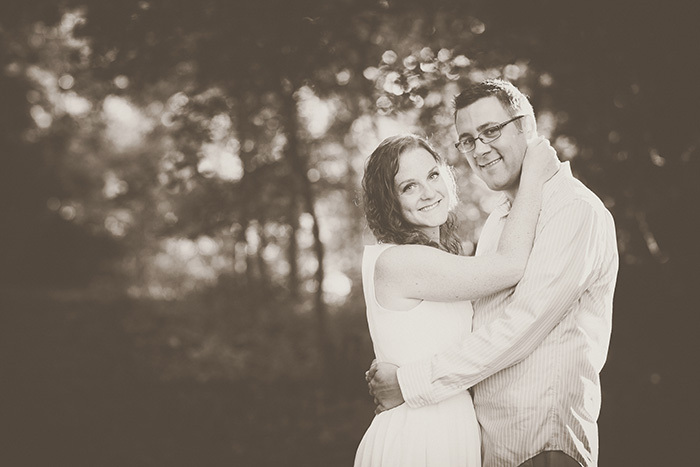 So let me be non-egotistical for a moment and bestow some well-deserved flattery on our photographer. 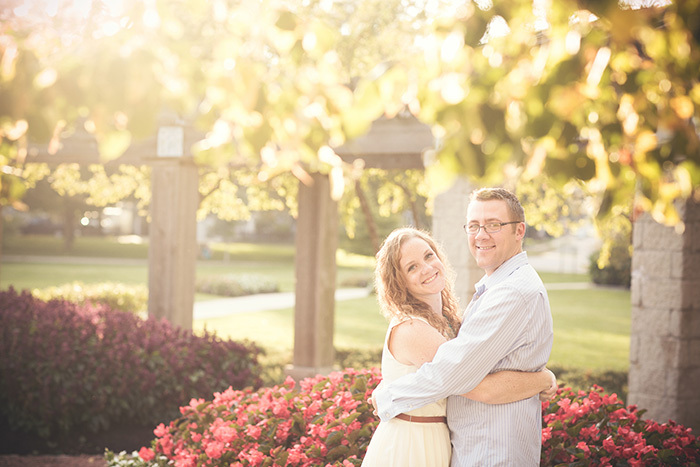 Bobbi, from The Salty Peanut Photography, was amazing! From the moment I met her, I felt totally comfortable, like this was someone I could totally be friends with. When you have to stand a little awkwardly with your fiancée, staring into each others’ eyes like, you know, it’s totally normal to gaze at each other…and then smooch on command—it’s great to feel comfortable with the person on the other side of that camera. Bobbi was a lot of fun and full of ideas, and we had such a great time running around town, into fields, and along the beach while she snapped our pictures. I love Bobbi’s photography style. She’s all about “refurbished memories”—capturing the little moments for people to look at and fall in love with all over again. 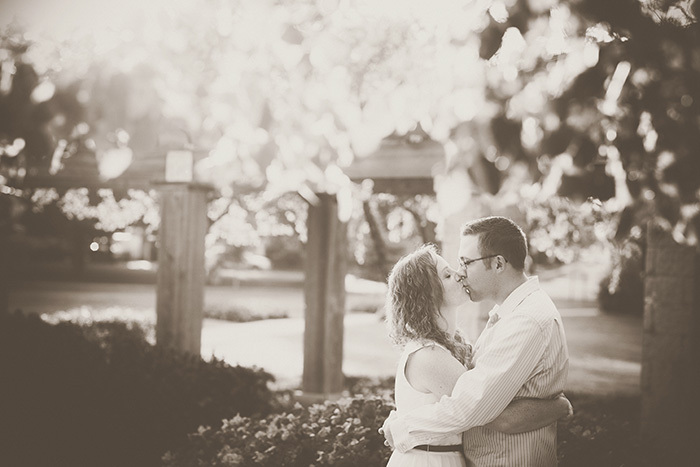 Her images have a sort-of vintage feel to them, soft and romantic. 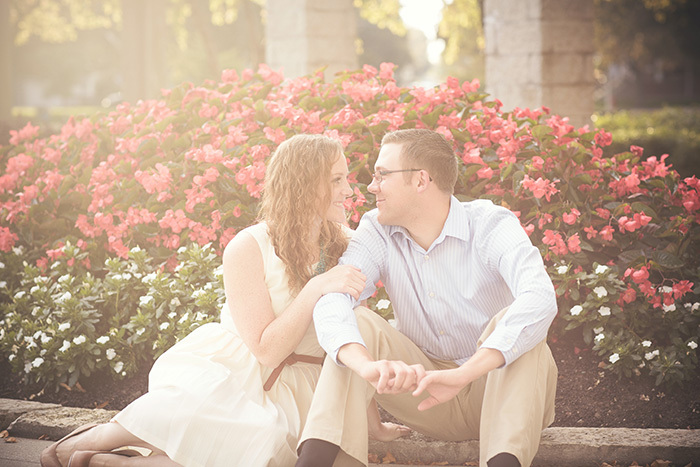 Our engagement shoot took place about a month ago, and I’ve been counting down the days ‘til Mr. Mailman might bring us the images. 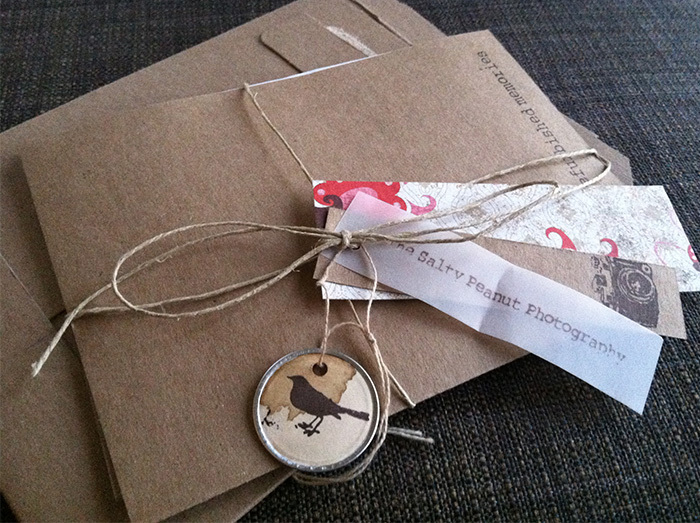 So on Saturday, when he drove up our driveway and gave us this little brown package, I was sooo stoked! Look how cute she packages up the disc. I love thoughtful details. 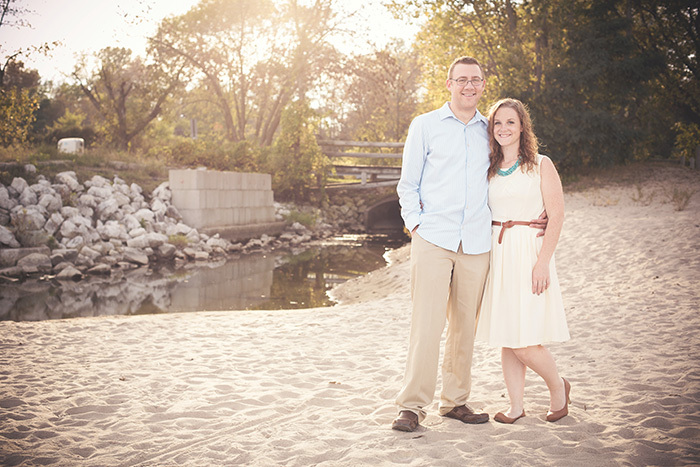 Matt & I sat on our couch, huddled together, with grins plastered on our faces as we clicked through the images one by one. Our shoot was scheduled just before the weather took on a chilly bite, as the leaves and plants were starting to turn and welcome the fall season. I thought we’d have more fall foliage to work with, but the timing was perfect nonetheless: It was a warm day, full of bright sunshine, with green leaves & pretty flowers still sticking around for just a while longer. We smiled. We loved. We goofed off a little. It was a perfect afternoon, and now we have those moments captured in so many perfect photos that I fear I’ll have to make a Matt & Amanda shrine wall so I can frame them all. The only down side to all these fabulous pictures, is it will be impossible to figure out which one(s) to use for our Save the Date! I’ll take that dilemma. What kind of photography style do you like the most? 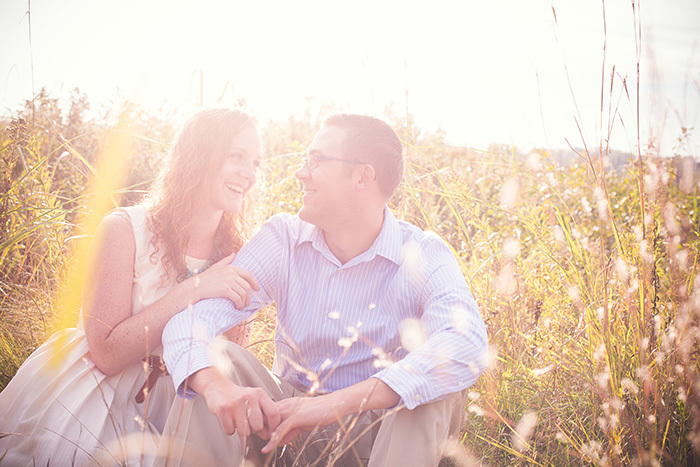 Where did/would you have your engagement pictures taken? 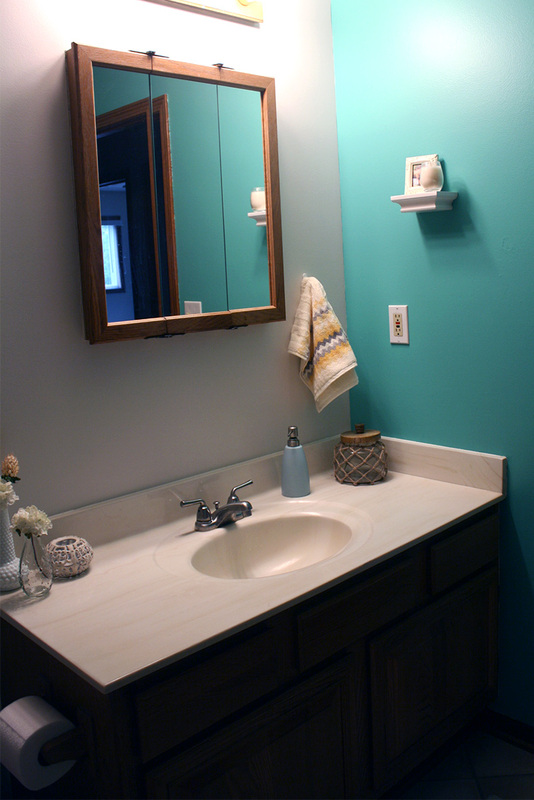 Beach Bathroom Makeover – The Final Look! 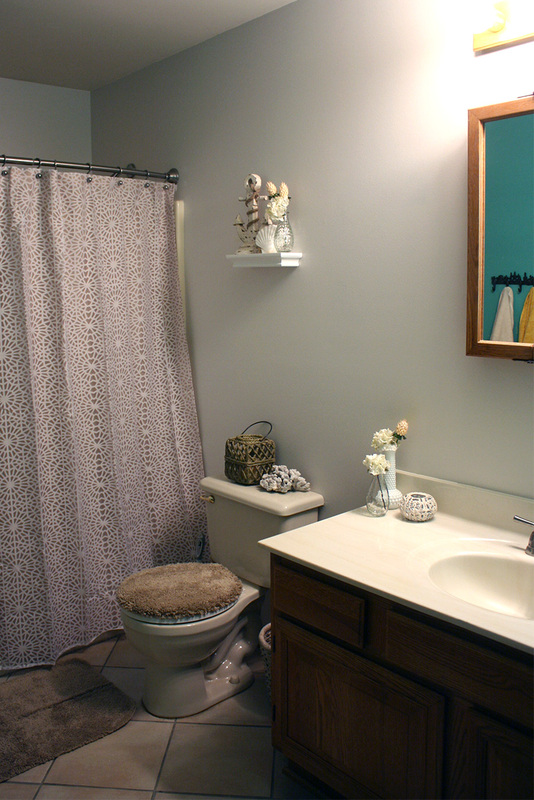 Our bathroom makeover is done! 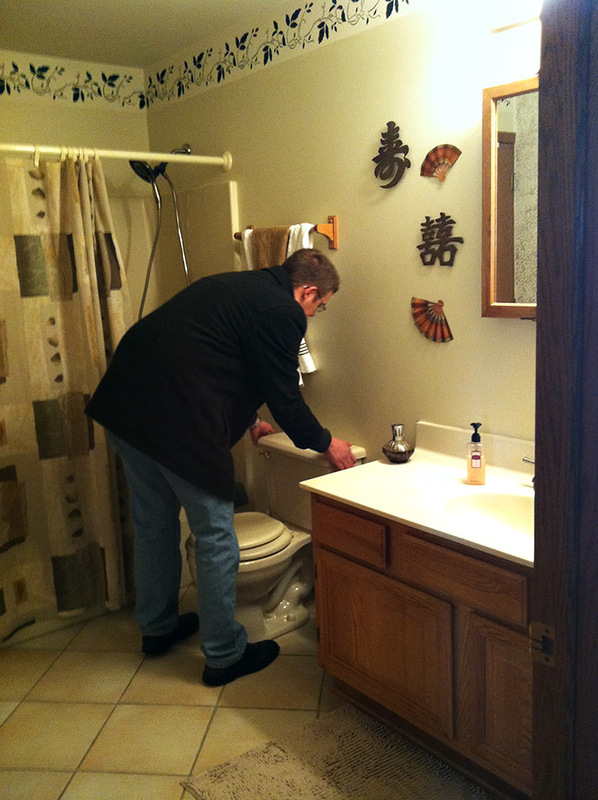 Here’s a reminder of what the bathroom looked like before. This is how the old owner had it decorated. 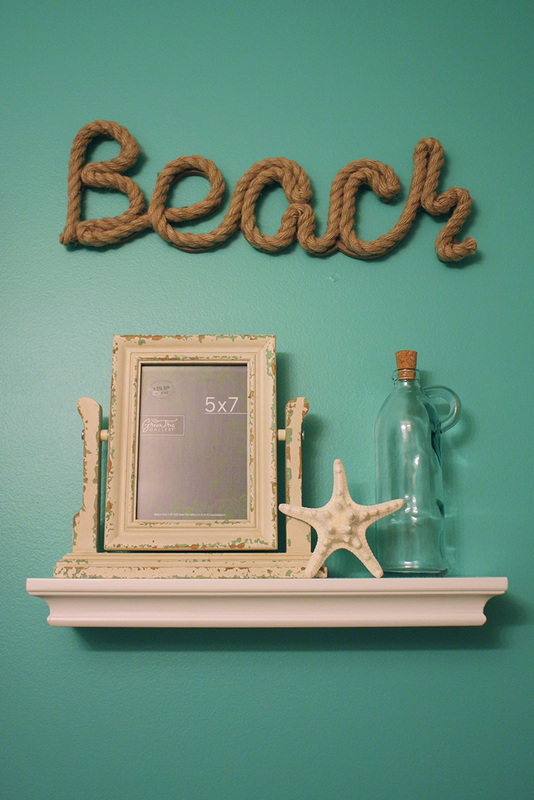 If you read my beach bathroom inspiration post, you know I was going for a beachy feel with our makeover. 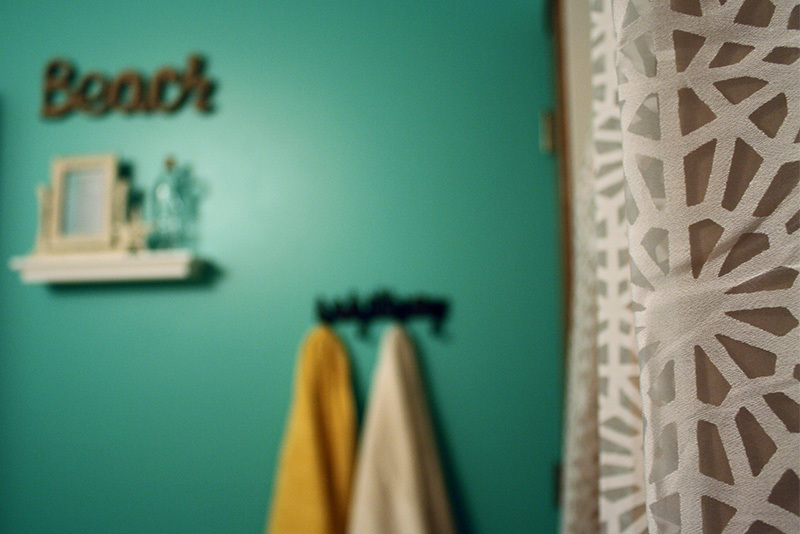 I wanted it to be fun, vibrant and sunny—a nice place to get ready in the morning. And mostly, a room I wasn’t embarrassed about, as it is the main guest bathroom! For the paint colors, I went with a bright, teal-jade green that I’ve been obsessed with this year. The paint is from Sherwin Williams. The green is called “Larchmere” (SW6752). As soon as I started painting it on the wall, I knew it was perfect! I wanted to accent this with a neutral that still had a little modern touch, so I went with a light grey called “Eider White” (SW7014). I think together, the colors have a modern punch to them, but the grey helps tone the green down so it’s no overpowering. 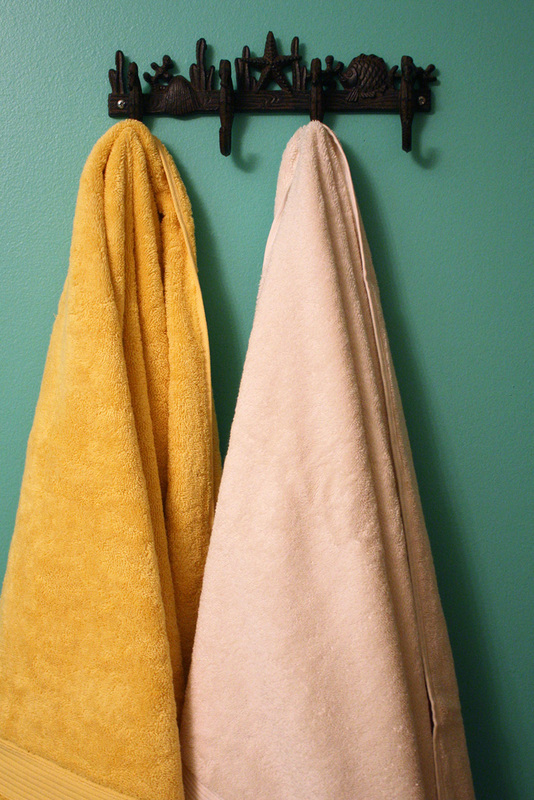 For decorating accents, I wanted to go with neutral whites and tans (a la the sandy beach), and sunny yellows. Incorporating the tan really helped tie in the existing wood. I am not a huge fan of these medium woods, especially the medicine cabinet/sink vanity, but we don’t have a budget to overhaul those at the moment. Bringing in the tan family helped make those part of the design, rather than an unwanted afterthought that we’re kind of stuck with. And of course, the yellow brings in a little dose of sunshine & brightens the mood! My favorite parts of the bathroom are all of the little details in the decorations. I had a lot of fun picking out everything, mixing & matching them to work together but create texture and interest. 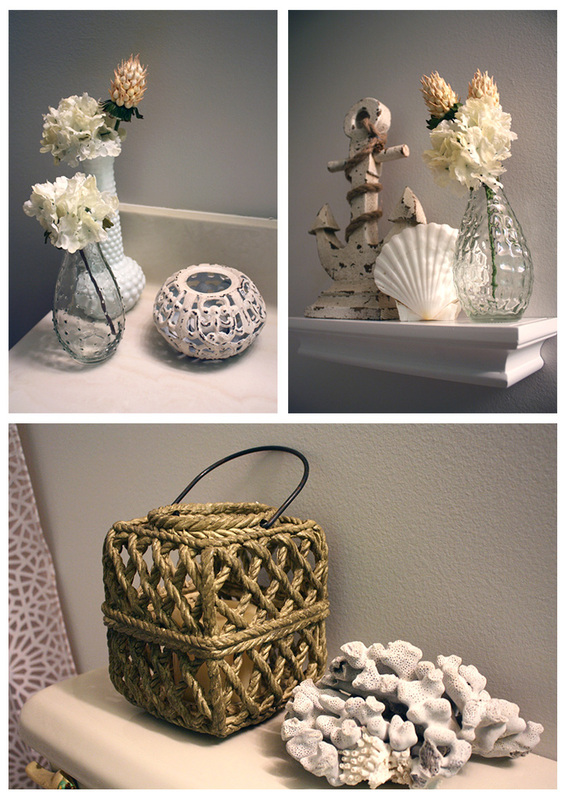 Clockwise from top left: milk glass vase, $0.25 at a garage sale; clear vase and tea light holder from Hobby Lobby; wood & rope anchor, seashells & clear vase from Hobby Lobby; white shelf from Target; ceramic “rope” candle holder from Hobby Lobby; piece of coral, $2 at garage sale. I found this shower curtain at Target a few months ago right after we bought the house. I bought it not knowing yet what the plan was for the bathroom, and it ended up fitting in seamlessly. Metal towel holder from Hobby Lobby. 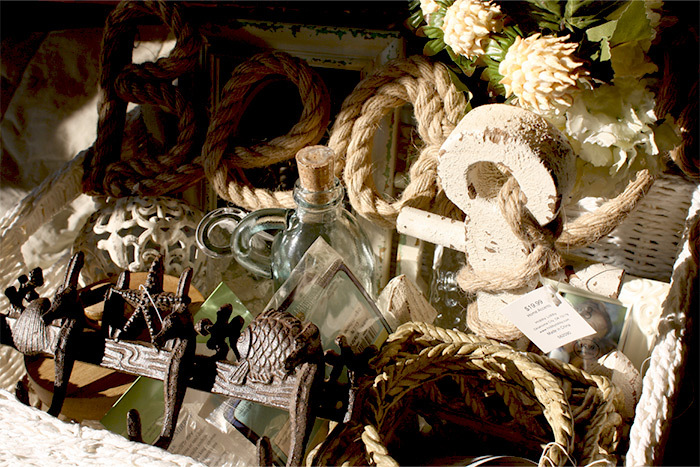 And of course, my rope “Beach” kind of hits you over the head with the room’s theme. 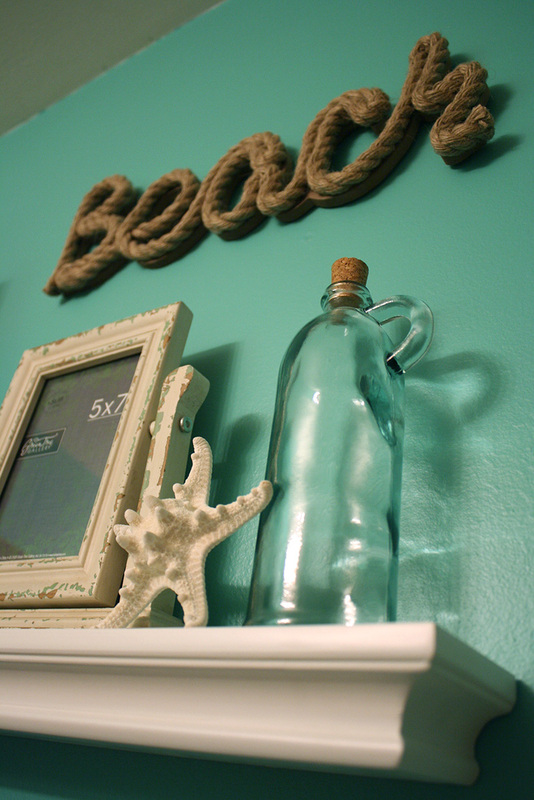 “Beach” rope sign, distressed picture frame, starfish & glass bottle from Hobby Lobby. Shelf from Target. I’m notorious for taking FOREVER to fill in picture frames with real pictures. I promise that’s on my to-do list this week. I also want to fill the corked bottle with sand from the beach. 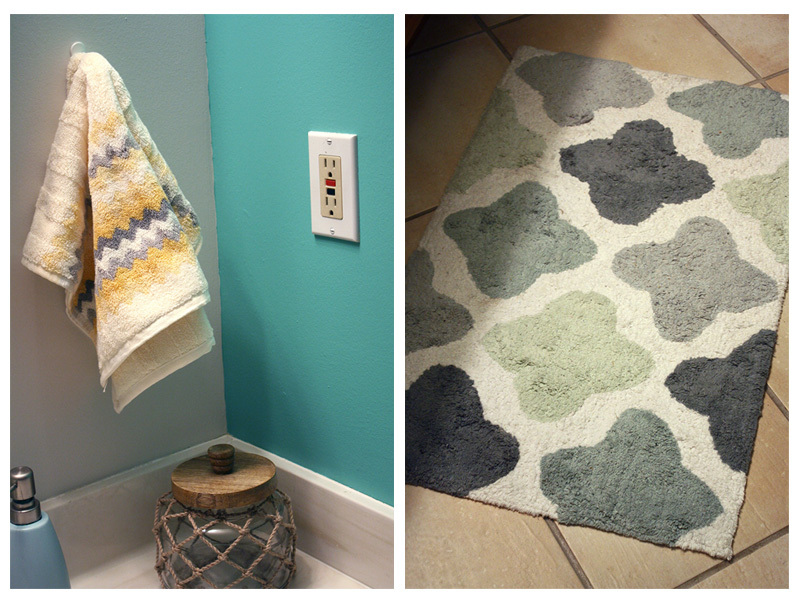 Yellow chevron hand towels from Target; rope & glass jar from Hobby Lobby; rug from Marshalls. I heart chevron patterns right now in a major way (who doesn’t?) so these hand towels seemed like the natural choice. I also loved the pattern and colors in the rug I put at the foot of the sink; this was another purchase I made a few months ago that I was able to incorporate with the design. There you have it! 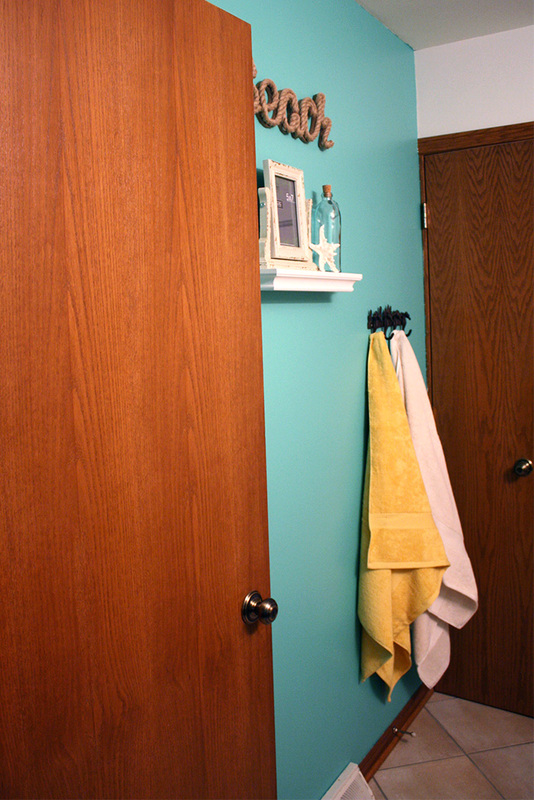 A few coats of paint, new decorations & towels, and we have a whole new bathroom. What do you think? Anything you would add or change? 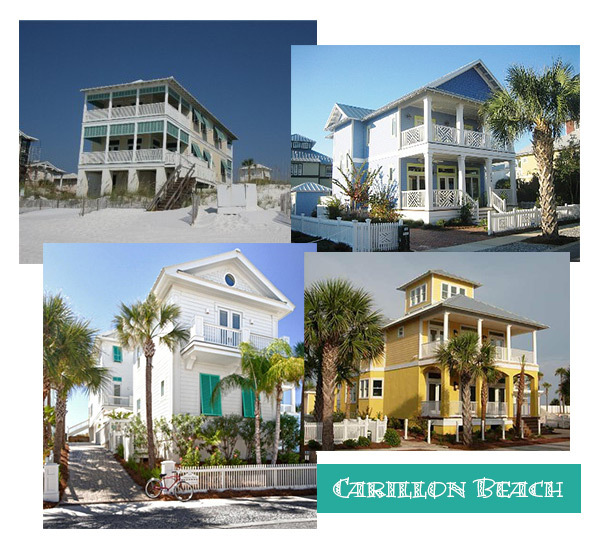 It all started in Carillon Beach, Florida. 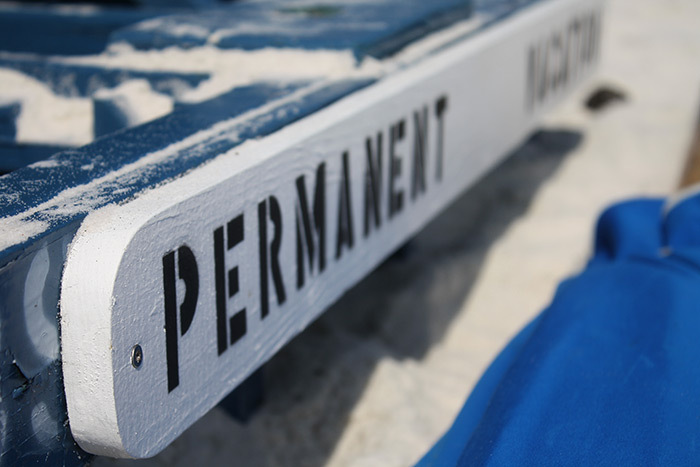 All the houses are named, and ours was called “Permanent Vacation.” Seriously, we all wanted to make it our permanent vacation. But, the best we could do was plan to come back for another vacation two years later, and that’s how we came back to Carillon this past June. 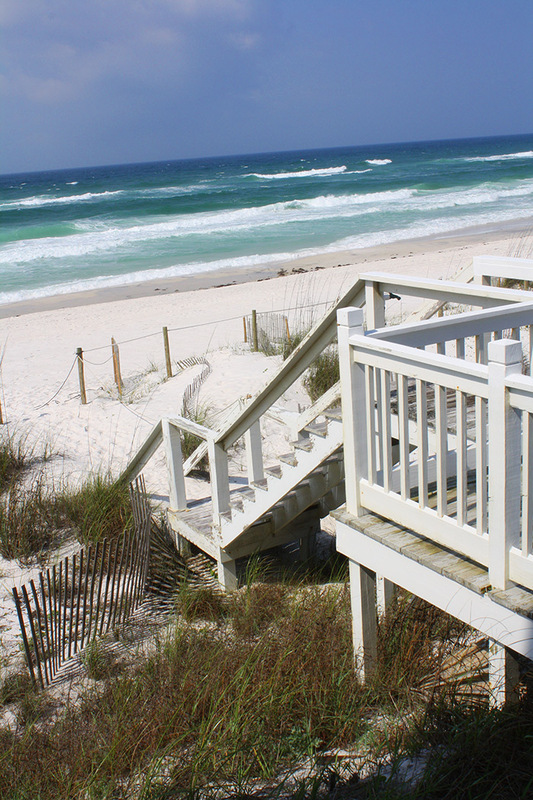 With that in mind, you can see why it was so easy to be inspired by all the gorgeous beach houses in Florida! A lot of them were really fun colors and beautifully landscaped on the outside. 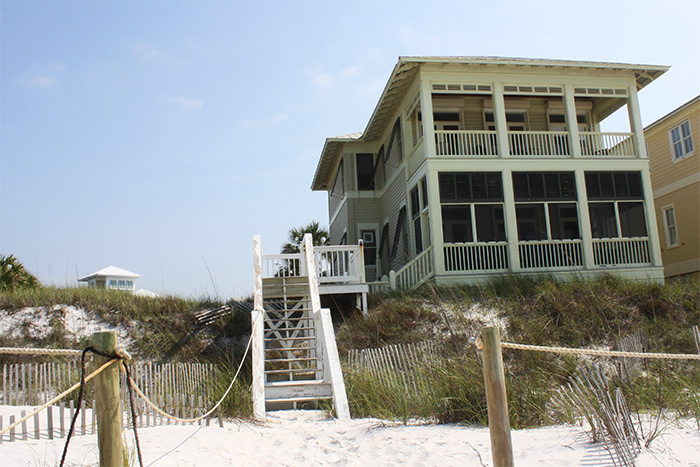 On the inside, I could imagine their wide-open floor plans full of fun and quirky beach accents, pictures, and colors, just like the house we were in. 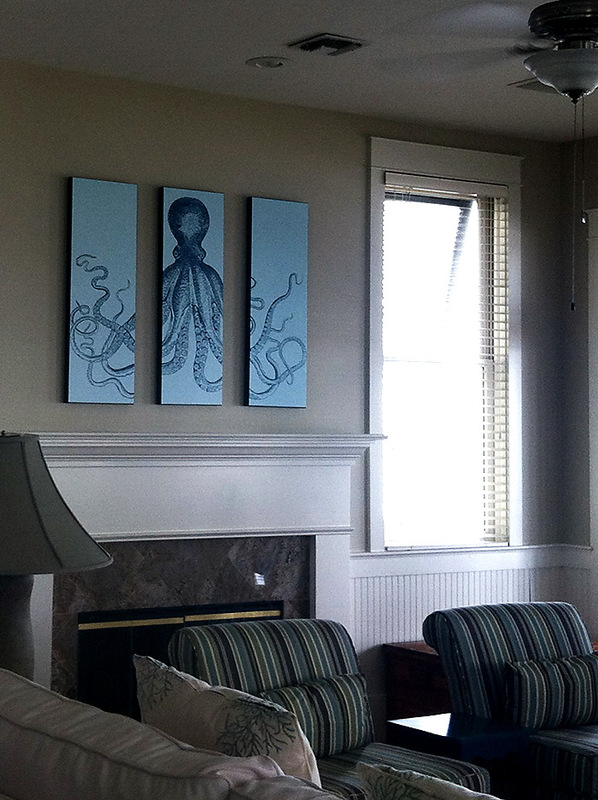 I loved this octopus triptych so much. One day, I was literally standing at the sink in one of the beach house bathrooms, looking into a seashell encrusted mirror at the bright seafoam green walls and thought, I have to have this! 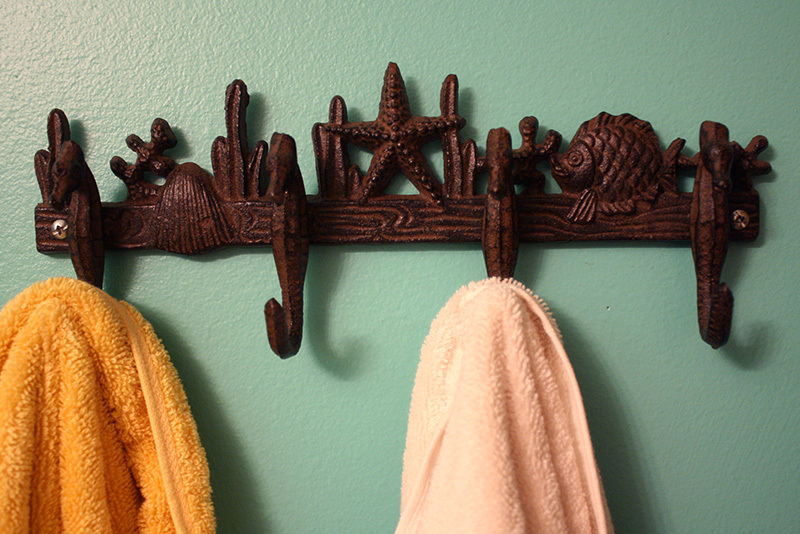 At home, we’re quite close to Lake Michigan, so I figured, why not make our bathroom have a beach theme? Lake Michigan, Gulf of Mexico—practically the same thing. I started out on Pinterest (duh) looking for inspiration. A few months back, I had been inspired by the palette of colors in these Anthropologie bowls. I know. Bathrooms, bowls—I find inspiration in strange places. But for some reason, this year I have been loving the rich jade green shades, so when I picked up a paint sample for what I thought I should want (a lighter, quasi seafoam green), I wasn’t surprised when it just didn’t look quite right. On a whim, I didn’t even buy a new sample, I just found the paint chip closest to the color I had been obsessed with for months and bought the paint. Okay, I conceded. Probably true. I didn’t want it to look like the Hulk puked all over our nice new bathroom. Then the fun part—decorations. We don’t have money to get a new vanity (though the current one seems a foot shorter than normal, what’s with that? ); and no new toilet, shower, tile, etc. They are all in fairly decent shape, anyway. So I decided to go all out with the decorations, to take away from some of my not-so-favorite parts of the bathroom. I again started with Pinterest, and found a barrage of beachy bathroom-inspired images to waste time looking at research. Over the next weekend, we hit up some garage sales, and at one of them I was lucky enough to come across a huge chunk of coral for $3! I was pretty stoked. For the rest of my needs, I visited Hobby Lobby and—oh lucky day—pretty much EVERYthing I picked up was 50% off. Spectacular. I kind of went crazy, but I found a ton of great items and can’t wait to see them in place. Is it weird if I decide to hang out in the bathroom all the time, once this is done? 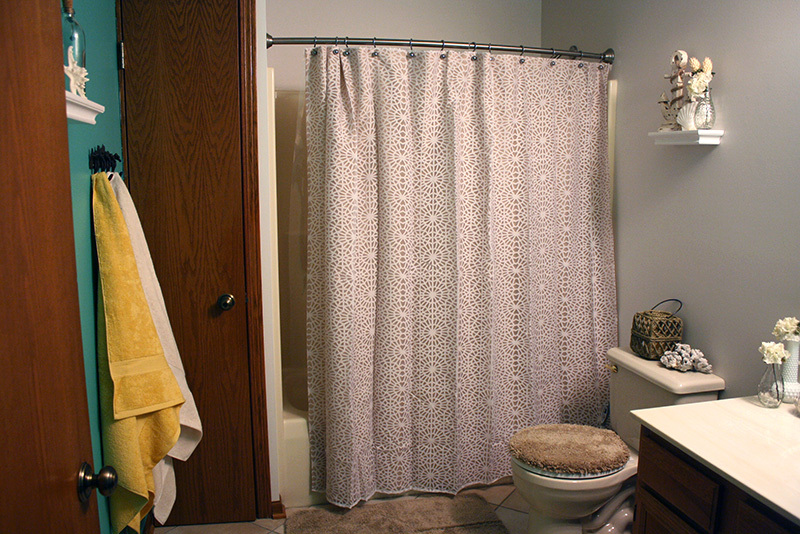 Watch for the “after” post of our new bathroom this weekend! Where do you get inspiration? Do you have any “themed” rooms?